Emanuel Cleaver Molotov cocktail: Black Missouri congressman's office targeted. 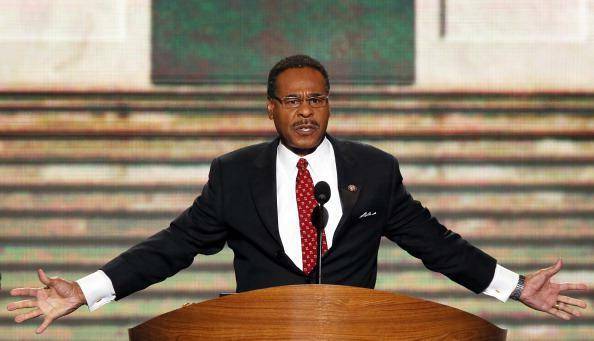 Rep. Emanuel Cleaver at the 2012 Democratic National Convention. Responding officers found a broken window on the northwest side of the building. On the ground below the window were two broken liquor bottles — one rum and one Jagermeister — with paper towels sticking out of the necks of the bottles, police said. They resembled Molotov cocktails and the paper towels appeared to have been ignited but extinguished during flight, police said. The only damage was the broken window. There was no fire damage to the building. No one was in the office and no one was hurt. Cleaver’s chief of staff told the paper that a similar incident had occurred six years ago.